BAGHDAD, Iraq (CNN) -- Gunmen broke into the house of a women's rights activist in the volatile northern Iraqi city of Kirkuk on Thursday and beheaded her, police said. 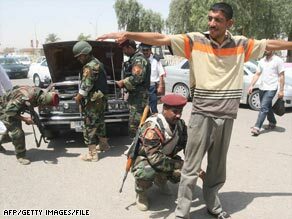 Iraqi Interior Ministry troops conduct inspections at a checkpoint in the southern Iraqi city of Basra in May. The victim was identified as Nahla Hussain, the leader of the women's league of the Kurdish Communist Party. She was alone in the house at the time of her death. It is not known what the circumstances were that led to the attack. Violence against women has been an ongoing problem in Iraq. The killing comes ahead of next month's provincial elections, a post-Saddam era watershed event that's generating an uptick in civil unrest and political infighting. Twenty-four officers from the interior and defense ministries were arrested this week accused of facilitating the activities of former Baathist regime members, the Iraqi prime minister's media spokesman said Thursday. The arrests appear to have been politically motivated, a senior U.S. military official told CNN Thursday. The official said Prime Minister Nuri al-Maliki is believed to be behind the arrests. Iraqi Interior Ministry officials said the detained officers have links to the al-Awda party, an underground successor to Saddam Hussein's Baath party, . The Baathist movement ruled Iraq for 35 years but was banned after Hussein was overthrown in the 2003 U.S.-led invasion of Iraq. The arrests, which were made inside and outside ministerial offices, were carried out by an elite force that reports directly to al-Maliki, according to an Interior Ministry official who spoke on condition of anonymity. Al-Maliki's media spokesman, Yasseen Majeed, denied that report and said the arrests were made by Iraqi security forces acting on judicial arrest warrants. Majeed, al-Maliki's military office, and Maj. Gen. Qassim Atta, spokesman for the Baghdad Operations Command told Iraqi State TV that reports of a planned coup are incorrect. Majeed said the arrests were precautionary measures. He said investigations are continuing into the suspects, who are accused of facilitating the activities of "terrorists" and "outlaws." Initial reports listed arrest tolls that ranged from 20s to the 30s and said the arrested were all from the Interior Ministry, which oversees policing, border enforcement and internal security. The ministry has been criticized by Iraqi and U.S. officials for inefficiency, corruption and infiltration by Shiite militia groups during the Sunni-Shiite violence in 2006 and 2007. According to the Interior Ministry's spokesman, Maj. Gen. Abdul Karim Khalaf, the highest-ranking person taken into custody was a brigadier general, and the others were low-ranking officers. He said 23 officers were detained and judicial authorities were questioning them. The Interior Ministry official who spoke on condition of anonymity said at least 32 ministry employees were arrested between Monday and Wednesday. That official had no information on the reasons behind the arrests. He said at least two generals were among the arrested, and identified one as Gen. Ahmed Taha Abu Ragheef, head of the ministry's Internal Affairs Department. Khalaf said Ragheef was not among those arrested, and Ragheef himself appeared on state TV to issue a denial. He said he took part in the investigation that led to the action. It is not yet clear how many Sunnis and Shiites were arrested in the case, but Saddamists tend to be Sunnis. Al-Maliki is a Shiite, and the government is dominated by a Shiite bloc, called the United Iraqi Alliance, and a Kurdish bloc. One knowledgeable Iraqi politician told CNN he believes this and other discord at present in Iraq, such as attacks, arrests and political infighting, stems from internal conflicts between political parties ahead of the January 31 provincial elections. The voting -- to be held in 14 of Iraq's 18 provinces -- has been much anticipated by U.S. and Iraqi officials, who hope the election of local government officials can empower grass-roots Iraqis and give alienated Sunni Arabs more political clout. Sunnis, who had more power under Saddam than they do now, feel they have been marginalized in Iraq's new political system, where the majority Shiite population and the Kurds have emerged as powers. Elections won't be held in Tameem province, where political disputes in the city of Kirkuk have yet to be resolved, and in the three Kurdish autonomous region provinces. As for the Interior Ministry, a September 2007 report assessing the status of Iraq's security forces slammed it and the National Police, which it operates. The report by the Independent Commission on Security Forces in Iraq, called Interior "a ministry in name only" and said it was "widely regarded as being dysfunctional and sectarian, and suffers from ineffective leadership." It said the National Police force has been "operationally ineffective" and "sectarianism in its units undermines its ability to provide security; the force is not viable in its current form. The National Police should be disbanded and reorganized." The Defense Ministry oversees the military. The 2007 report had promising words for the Iraqi army, special forces, navy and air force, describing them as "increasingly effective" and "capable of assuming greater responsibility for the internal security of Iraq."